September 3rd this year will mark the 15th anniversary of the creation of the Network for Regional Government for Sustainable Development. 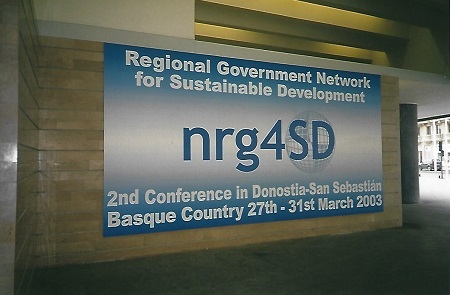 There probably are not too many people now engaged in the sustainable development process at the global level who know the history of the setting up of the Network for Regional Government 4 Sustainable Development (nrg4sd). Let me tell you the story it all began one evening during the fourth preparatory meeting for the World Summit on Sustainable Development (WSSD) held in Bali Indonesia. Stakeholder Forum, which I was the Executive Director of at the time, had organized a side event looking at the issue of governance and the responsibility for follow up to the Johannesburg Plan of Implementation. During the side event, a number of Regional Governments attending the prepcom expressed concern that there was no body that represented their views and concerns. It seemed that the local authority bodies were more focused at the cities and towns level and not the regional government level. It's clear that in many federated countries Germany, Canada, Spain, Belgium, South Africa, Brazil and the USA come to mind there is more power given to that level of government and in the runup to WSSD it looked like more countries were moving in that direction the UK is a good example. Stakeholder hosted an informal discussion with a number of Regional Government representatives in Bali that included: Flanders, Catalonia, The Basque Country, Wales, Western Australia, Quebec also in attendance was the US State Department. 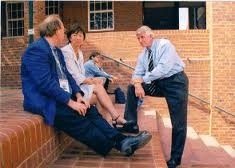 It was decided with only 6 weeks before WSSD to set up a new Network for Regional Government. Stakeholder Forum was contracted to organize the event in Johannesburg or rather within the Gauteng region in South Africa. 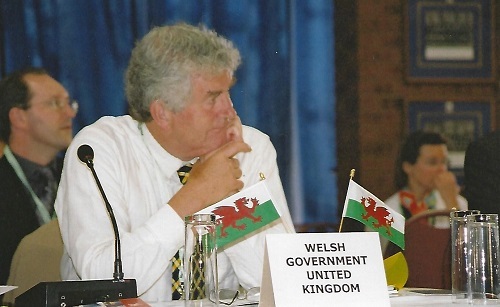 Rhodri Morgan the First Minister of Wales attended and spoke and would host and chair a meeting of leaders of sub national governments attending. 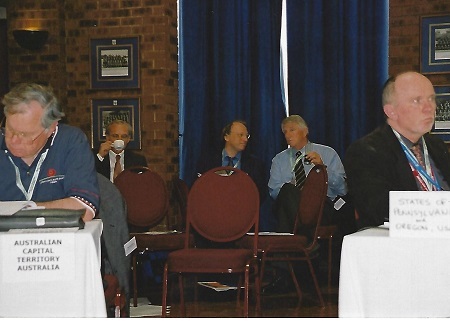 Matthew Quinn (seated behind Rhodri) would be the main support for the First Minister and the advocate for nrg4sd within Wales. Wales would continue with Sao Paulo, Gauteng, Flanders, the Basque Country and Catalonia to play an important role over the coming years. It would co-chair the body twice. "Very many different types and names for regional governments in different parts of the world. The defining feature of the emerging group of governments participating in the new RG network for sustainable development is that they govern territories that are the largest and first level of political subdivision within individual nation states represented at the United Nations. Regional Governments include for example such familiar examples as Regions, Provinces, States and Prefectures, but also Autonomous Communities, Communes, Departments, Districts, Divisions, Emirates, Federations, Govemorates, Juletule, Kilil, Nations, Oblastey, Rayons, Territories, Voblasti, Welayatlar and Zones." "We take this opportunity on the Tenth Anniversary of the Rio Earth Summit to commit ourselves to sustainable development as outlined in the Agenda 21 and the Rio Declaration, and the United Nations' Millennium Declaration. The spheres of government that we represent are responsible for many of the policies, systems and services that can make possible a more sustainable future for our citizens. We consider Regional Governments, from the point of view of proximity, efficiency and spatial dimension, to be strategically located as a necessary and crucial sphere of government for the development of policy for and implementation of sustainable development. By reason of scale we are in many circumstances best placed to address specific sustainability issues and in other circumstances we are essential partners in solidarity with other spheres of government and civil society for integrated and coordinated policy and implementation. In co-operative relationships with other spheres of government, the principle of subsidiary should be applied." us in the development of their work as equal and essential partners on sustainable development." 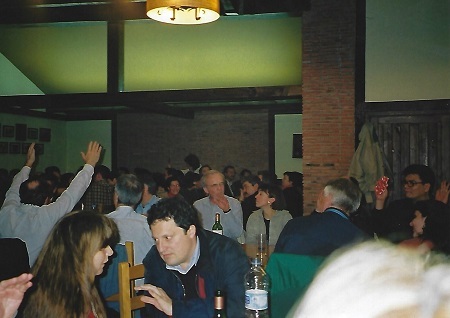 The second conference was planned for nine months later in the wonderful city of San Sebastian in The Basque Country. An interim Executive Committee was set up and Stakeholder Forum working with the Basque Government planned for the second conference. They also planned to hand over the Network out of the Conference to a new secretariat which the Conference would agree to establish. So began my personal love affair with San Sebastian. 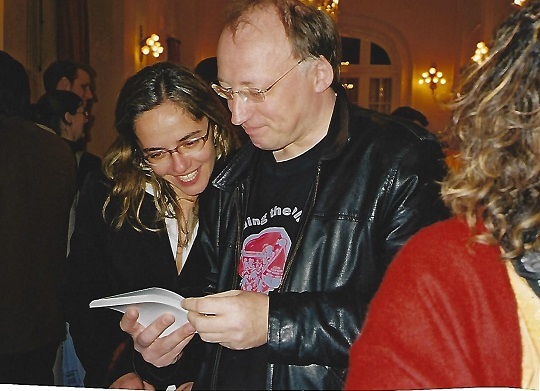 I moved there in October 2004 fifteen months after the conference and stayed until November 2009. 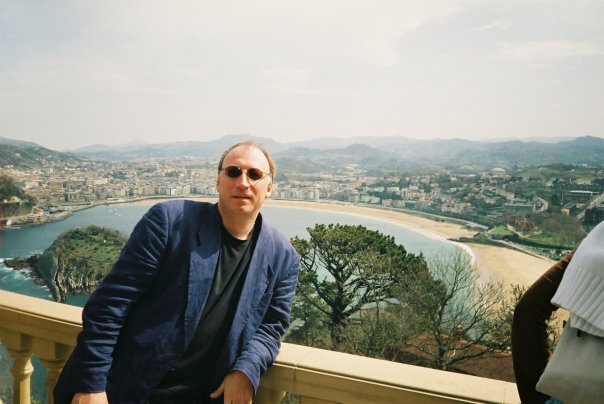 If you have never been to San Sebastian also known as Donestia then add it to your bucket list. It has the BEST food in Europe. 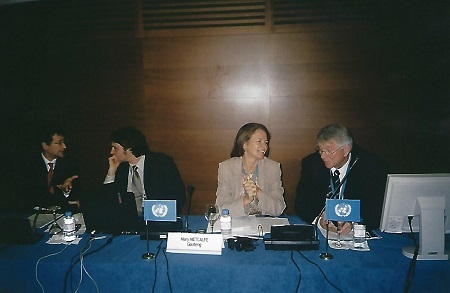 An aside Donestia/San Sebastian also played a significant role in the preparation for Rio+20. 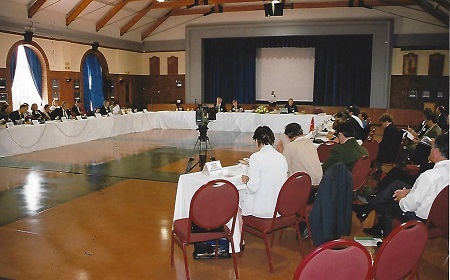 In November 2008 Stakeholder Forum hosted a government, UN and stakeholder retreat on the topic of what should a Rio+20 conference address? Brazil had secured in September G77 support for the proposed conference but with no details on what they thought it should address. The Basque government with Stakeholder Forum produced the first paper on what that might be and if you read it the Donostia Declaration bears a good resemblance to what the UN General Assembly agreed for the themes of Rio+20 13 months later on Christmas Eve 2009. Another one of the core group or should i say founders of nrg4SD Kenty Richardson from Catalonia enjoying one of the evening events. 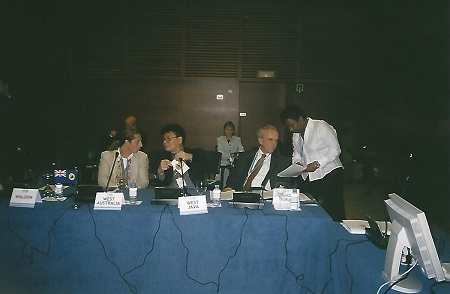 The first co-chairs of the Network elected in San Sebastian were The Basque Country and the Western Cape as the representative of developing countries. We are now 15 years since the Network was formally established and there is much to celebrate in the work it has done since WSSD. It is really amazing how much regional governments around the world are engaged with each other and within various multilateral processes. I'm less familiar with other domains now but on climate it has been in exponential growth since NRG was conceived. For a moment I wanted to just remember that first nine months of crazy activity to establish what has become an important voice for Regional Government at global meetings of sustainable development. Rosangela Goncalves (International Court of Environmental Arbitration and Conciliation (ICEAC)) and Felix Dodds (in my Marlon Brando phase) enjoying the nrg4sd reception at the amazing Maria Cristina Hotel. Very interesting, now that Kenya is struggling with the tensions between bi-level governments (national vs powerful county), also between counties and cities straining to be free (they were absorbed under the new constitution).. is this initiative still active?